Did you ever get that feeling? It sort of hits you a few years after taking photographs. Its a kind of like “I think I’m finally doing something right” feeling. I’m feeling that right now. I don’t know where it came from. I took a couple of photos, had an article in the local rag and bang it suddenly hit me, I’m finally getting it right. Its not just taking the right photograph its the pleasure that comes with it. The joy you get when you see a photograph you’ve taken and it says to you what you’ve been trying to say for months. The Road To Blackhall or Following my Father’s Footsteps has been like, and still is like, rediscovering who I am. I love walking the streets of Blackhall, talking to people, taking their photographs. They are what my life is all about, they are what made me. This is my past, my present and my future. I am working class and proud to be it. I am part of a working class community. I belong. I remember seeing a photograph of me as a baby sat on a blanket in the front garden. This photograph reminds me of that moment. The present and the past meet head on. A photograph of a child that I do not know and may never see again brings me a personal moment from my own childhood. One simple little photograph that says you’re doing what you set out to do. 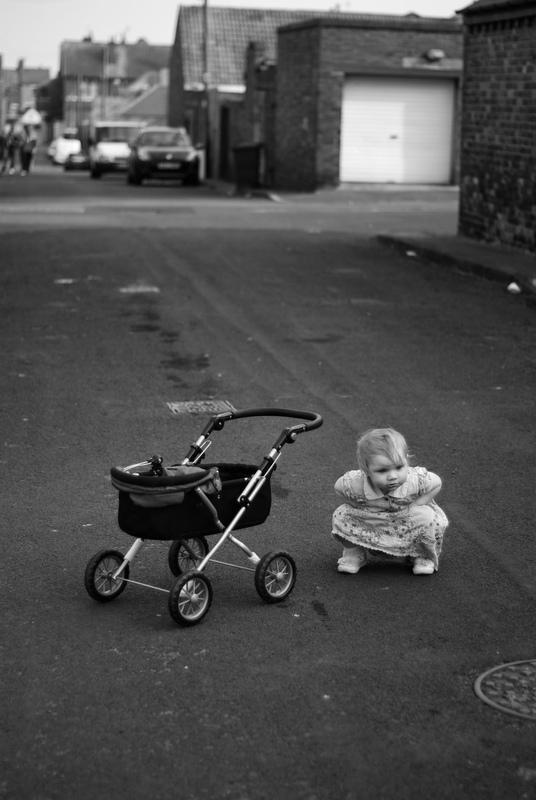 This entry was posted in Blackhall and tagged back street, childhood, girl, pram on April 12, 2015 by Catherine Ruocco.